Home Titanic Research Articles Slade Brothers: The Real Story? 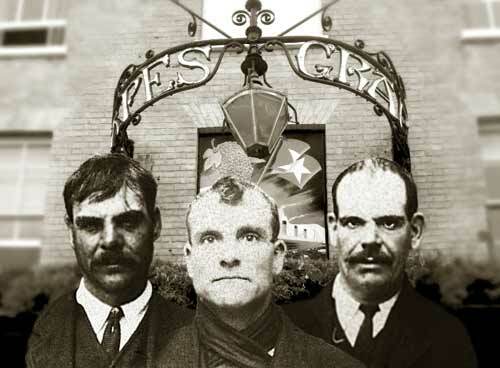 There are many versions of what is now the famous story of the Slade Brothers who just missed sailing on Titanic’s maiden transatlantic voyage because of their overindulgence at the Grapes public house in Oxford Street, Southampton. So what really happened? I first researched this topic three years ago, and since then additional information has come to light making a re-visit worthwhile. In addition to the information in the public domain, the information submitted here is based upon researching the original Titanic crew records, Census information, Southampton Street Directories, Merchant Navy Records, and the first-hand accounts of those who were with the Slades and other witnesses. I am pleased to have also had contact with descendants of the Slade family. Titanic arrived in Southampton, from Belfast, in the late evening of Tuesday the 3rd of April. She manoeuvred safely alongside 43/44 Berths in the White Star Dock just after midnight, and by the time that mooring lines were all secured, it was 1.15 a.m. on the morning of Wednesday the 4th. The next day, the ship was decked out with flags from stem to stern and preparations began for her departure and crossing of the Atlantic to her intended destination of New York. Due to a recent coal strike, many White Star and other liners were effectively laid-up in Southampton. In fact, many passengers due to cross the Atlantic on other ships were transferred to Titanic. On Friday the 6th, the hiring of crew for Titanic’s voyage began, and many of the crews of the laid-up ships were eager to be taken on. The Slade brothers were among them. Alfred aged 25, Bertram aged 26, and Thomas aged 27, were all taken on as Firemen, their engagement records showing them starting their service at 06.00, 6th of April. They gave their address as 21 Chantry Road, where they lived with their mother. Alfred had just finished a tour on the passenger/cargo ship Highland Glen, whilst Bertram and Thomas transferred from Titanic’s sister ship Olympic, which had left for New York the previous day and berthed at Southampton on March the 30th. (left to right) Bertram, Alfred and Thomas with the Grapes public house behind. On Sunday the 8th, as the rain came down in Southampton, Titanic took on 4000 tons of coal into her bunkers and fresh supplies of food were unloaded by local suppliers during Monday. The dock was bustling as other provisions were also arriving and being loaded: beer and wine, linens for the restaurants, flowers, pot plants and everything else imaginable needed for the most luxurious liner afloat. No doubt the Slades were packing their kit bags and bidding farewells. It is interesting to speculate whether, despite being used to the eve of joining a new ship, and even that Alfred had previously sailed on Olympic, there was just that little bit more sense of anticipation. On April the 10th, sailing day, the men who had signed on reported on board, at 8.00 a.m., for muster, after which they were dismissed to stand by for departure. Most went ashore. Two of these men, John Alexander Podesta and William Nutbean left the ship and went for a drink at the Newcastle Hotel. Podesta, aged 25, Fireman, and also from Chantry Road, had previously been on the White Star Liner Oceanic. Nutbean was a trimmer, recorded as living at The Sportsman’s Arms in the High Street, and transferred from the Royal Mail Line ship Parana. According to Podesta’s account, he and Nutbean left the hotel to make their way back to the ship around 11.15 a.m. Thinking they had plenty of time, they stopped off at the Grapes public house in Oxford Street for one more drink, and here they met up with the Slade brothers and other fellow crew members. These included Alfred Penney, Trimmer, aged 25; James Shaw, Fireman, aged 40; Frank Holden, Fireman, aged 29; and B. Brewer, Trimmer, aged 24. This was Penney’s first trip and he had been lodging with the Slades at Chantry Road. Holden, of 19 Albany Road, had been on the liner Adriatic. Brewer, of 211 Foundry, Lane had previously served on the Oceanic. Now the various versions of the story start to differ. Some say that it was one of the Brothers’ birthday - not quite true, Alfred’s birthday was the following day on the 13th, but perhaps it might have been an early celebration. Other accounts say that the brothers had been out the night before and missed the ship because they overindulged and slept in which also does not appear to be the case. At around 11.50a.m. the group left the Grapes, including Podesta, Nutbean and the Slade brothers. It is not clear who else was with them, but some accounts say that Shaw, Holden and Brewer were with the group. They raced to the top of Oxford Street and round by the Terminus and South Western Hotel. The story continues that as they were about to cross the road to the docks, a train was coming. Podesta and Nutbean ran in front of the train leaving the Slades and the rest of the party behind, who once eventually crossing, get to the docks too late to board the ship. Many accounts say that it was as they were about to cross Canute Road to Dock Gate No.4, that the train came out of the docks, blocking their way. Others say that the train was leaving the Terminus and crossing Canute Road into the docks through Dock Gate No.3. I believe neither of these to be the case. Podesta’s own words were “We were at the top of the main road and a passenger train was approaching us from another part of the docks”. Bearing those precise words in mind, and looking at the map, a number of things are evident. Firstly, Dock Gate No.4 is on Platform Road (labelled ‘B’), not Canute Road – the two merge at the South Western Hotel. If we look at the route that was most likely taken by the group from the Grapes (shown in green) – along Oxford Street and the right into Terminus Terrace, they would have come on to Platform Road with the South Western Hotel on their left. 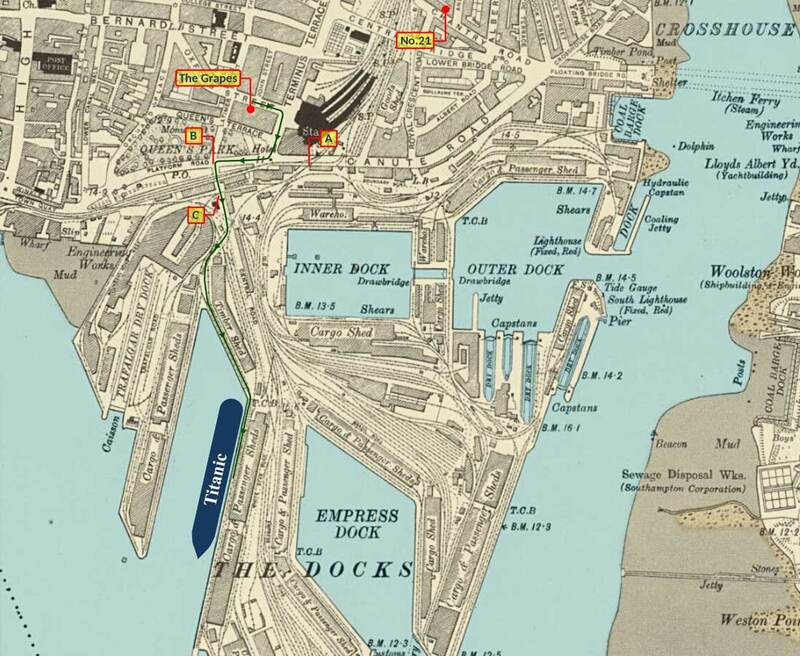 The railway line from the Terminus across to the dock entrance (Dock Gate No.3) is at the western end of the Hotel as seen on the map (labelled ‘A’), and clearly not blocking their route. There was no other railway line coming out of the docks and on to the road other than this line. The only line that could have carried a train to block them crossing Canute Road, or Platform Road would have been the line from the Royal Pier to the Terminus, but this only carried a small tank engine pulling a small number of carriages, not the “long” train referred to in the accounts. 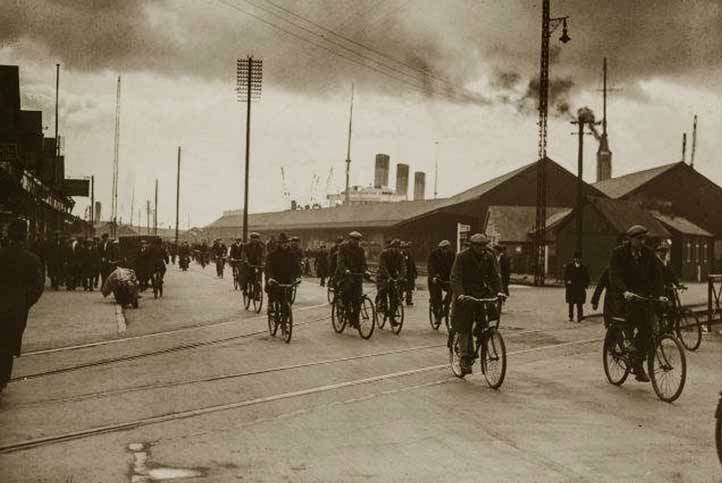 "We were at the top of the main road and a passenger train was approaching us from another part of the docks. I heard the Slades say, "Oh, let the train go by". But me and Nutbean crossed over and managed to board the liner. Being a long train, by the time it passed, the Slades were too late, and the gangway was down leaving them behind. So it seemed they did not have to go." Podesta says that he recalled hearing the famous line from the Slades "Oh, let the train go by". And significantly I believe “We were at the top of the main road and a passenger train was approaching us from another part of the docks”. Looking at the map, it is my theory that they had all crossed Platform Road and about to enter Central Road – fitting with Podesta saying “top of the main road” i.e. the top of Central Road. The map shows a railway line crossing Central Road near the junction with Platform Road (Labelled ‘C’). Podesta says “... train was approaching from another part of the docks – which would also fit. Now we get to varying accounts as to what happened when the Slades finally got to the ship, by which time Podesta and Nutbean were on board. The popular account is that at 11.59 a.m. Titanic’s gangway had already been lowered. This was the last gangway remaining connecting the ship (E-Deck towards the stern) to shore. Upon arriving, the Slades, with Penney, shouted up to be let on but were informed that they were too late and had been replaced by other crew members. In fact Richard Hosgood, Alfred Geer, Harry Witt, Leonard Kinsella, and two men by the names of Lloyd and Black, had been taken on board as substitutes. As it turned out, these six all perished when Titanic went down. Podesta and Nutbean, however, survived. As Holden and Shaw are also listed as Deserters in the Titanic crew records, it can only be assumed that they were left stranded on the dockside with the Slades and Penney. Another account identifies that the gangway was being supervised by sixth office Moody, and that it had indeed been withdrawn, after Podesta and Nutbean had embarked, only to have to be put in place again to let off a delivery boy called Lawrence. As Lawrence stepped ashore the Slades and Penney arrived which fits with Beesley’s account. A newspaper article dated February the 7th 2009 reports that one of the Titanic maintenance crew, Alex Hooper, was also with the Slades and the others, having a drink in the Grapes, and that he too missed the ship. John Podesta was born Alfred John Alexander Podesta on the 14th of September 1887. His Italian Father, John Giovanni Podesta died and 1890 and the 1891 shows John living with his mother Mary in St. Georges Place, Southampton. Mary re-married in 1893 and the 1901 census record shows John living with Mary and Stepfather William T. Smith in Melbourne Street, in the Chapel area of Southampton. William has the occupation of Gas Fitter, most probably at the Southampton Gas Light & Coke Company in the same street. In 1911, the census record shows them living at No.21 Chantry Road, also in Chapel, and the same house where the Slade Bothers lived with their mother. Also staying at the house, was a visitor, Daisy Chivers whom John later married. On the 14th of April, Podesta and Nutbean went off duty at 8 pm and later, as they left the mess-room they heard the ship’s lookouts cry out “Ice ahead, sir!” Podesta and Nutbean went up on deck to look, but they did not see anything. Podesta said “It was a lovely calm night but pitch black.” They returned inside and went down to their bunk-room. It is not the intention to give an account of the sinking here, but to give some extracts of Podesta’s interview published by the Southern Daily Echo on the 28th May 1968. “So, the crash came - it sounded like tearing off a strip of calico - nothing more, only a quiver. It did not even wake up those who were in a good sleep”. Boatswain Nicholls had to go and order everyone to their boat stations. Podesta and Nutbean were told to get into lifeboat No.7, but it was full, so they helped lower it instead. Nutbean started to look around for something with which to make a raft when he found another lifeboat under the bridge – No.3 lifeboat which was the farthest forward of the starboard row of lifeboats. Murdoch ordered them to jump in. In the early hours of the morning they saw the lights of the Carpathia steaming gradually towards them. When dawn broke, the Carpathia was still some distance away, so they began to pull towards her, reaching her mid-morning. The Carpathia docked in New York on the 18th of April and Podesta, Nutbean along with other survivors were transferred to the Lapland, returning to Plymouth from where they took a train back to Southampton. After Podesta returned to England, he married Daisy Florence Chivers. He continued his time in the Merchant Navy and records show him serving on cargo ships during WW1, and then returning on passenger liners through to at least 1920, and including Olympic, Teutonic, Mauretania, Berengaria and Homeric. The 1939 Register records him living with Daisy in Paget Street, Southampton with the occupation of Fitter’s Mate. Daisy died in 1964 and John died on the 13th of May 1968 aged 80. He is buried at South Stoneham Cemetery, Southampton. Slade Brothers: Who were they and what happened to them? Twelve months earlier, on the 2nd of April, the census records show two families living at 21 Chantry Road. Mary Smith with son John Podesta as previously mentioned, and widow Mrs Slade, living with two sons Harry and Edgar. The record also shows that Sophia had eighteen children with ten still living. With Alfred, Bertram and Thomas at sea, this would explain their absence. The previous census of 1901 shows Sophia, and husband William, living at No.29 King Street, Southampton. William is a Coal Porter. Both of them were born in 1851, confirmed in the 1911 census. None of the three brothers are listed. Alfred would have been twelve years of age – possibly all at sea as boys, or away at school? No additional definitive records can be found. In 1891, the census records William and Sophia living in Cross Street, Southampton with William still a Coal Porter. Thomas Slade is listed with a birth date of 1882, inconsistent with his birth date of 1885 in the Titanic records, and probably not within the limits of error often seen in census records where ages were uncertain. The difference between a four-year-old and a nine-year-old are usually quite noticeable. 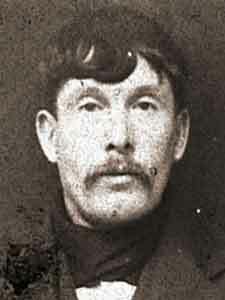 Thomas Slade is also recorded with a birth date of 1882, which again is completely different from his Titanic records; his recorded age of 27 would equate to a birth year of 1888. No records can be found of Bertram or any child with the first name initial ‘D’. Is this the wrong family? The Chantry Road address suggests not, and no records could be found of Slades in the area with any matching characteristics. if we then take a look at available Merchant Navy records we find a CR10 Identity Card for Alfred which gives us his birth date as 13th April 1887 - consistent with the Titanic records. The maiden name of Alfred’s inferred mother Sophia, in the census records was Crump and the only birth record found is of Alfred Edward Slade where the mother’s maiden name was Crump; the birth is in the fourth quarter of 1887. One has to assume that this is the difference between the actual birth date and when it was registered. The 1939 Register show Alfred living with his wife at 21 Chantry Road. His birth date is recorded as 13th July 1887. For Bertram, a CR10 Identity Card exists showing a birth date of the 5th of February 1884 which is not quite aligned to the Titanic records. The Titanic records for Thomas (K) as previously mentioned give us a birth year of c1885 and a CR10 Identification Card shows a birth date for Thomas (no ‘K’) as 2nd April 1884. So something terribly wrong here as Bertram was born in April the same year!! But, the only records that can be found of a Southampton born Thomas (K) are those from a completely different area, and he was a School Teacher. Despite all of the date discrepancies, and with the lack of other Slade candidates that fit into the general framework, I think it is fair to conclude that the Slade brothers were born to Sophia and William Slade in Southampton, and after missing the Titanic voyage to their possible fate, carried on in the Merchant Navy as those identified in the CR10 records. In the early census returns enumerators would record information in response to verbal questions to the occupants of the addresses they visited. Apart from errors arising from the information given – many people could not read or write, let alone know the dates of their birth or those of their children, the enumerators themselves very often made errors during their transcription. In addition, seamen also very often didn’t know their dates of birth, and sometimes even lied about their age. To confirm these conclusions, further work would be necessary, looking at the birth certificates of the brothers to ascertain the actual birth dates and to confirm Sophia Crump as their mother. The first possible record that could relate to Alfred after April 1912, is of an A. Slade, born in 1887, being a Fireman on either Ionian or Viper. His CR10 Merchant Navy Identity card, lists a number ships that he served on between November 1918 until February 1921, and including RMS Baltic, Aquitania, Mauretania and Adriatic. He was undoubtedly on cargo ships requisitioned by the Government during WW1, and is listed as receiving the Mercantile Marine Medal and the British War Medal. His Medal Card gives his address as 21 Chantry Road. As mentioned earlier Alfred appeared to have married, listed in the 1939 Register living with who is resumed to be his wife Alice, eight years his junior. Curiously his date of birth is stated as the 13th of July rather than 13th of February. There are two records relating to an Alfred marrying an Alice. One is in 1909, the other in 1920 – neither seem to fit the bill. No definitive record of Arthur’s death can be found. No definitive records can be found of Bertram’s movements immediately after the sailing of Titanic. It is almost certain that he remained at sea and served during WW1 as there is a Medal Card showing him being awarded the Mercantile Marine Medal and the British War Medal like his brother Alfred. There are no definitive records suggesting that Bertram married. His Merchant Navy CR10 Identification Card lists ships he served on from October 1918 through to December 1922, and includes RMS Olympic, Teutonic, Lapland, Berengaria and Homeric, which appears to be his last ship. The 1939 Register shows Bertram living in St. Michael’s Lodging House in Southampton. St Michael's House was a public lodging house built by the town council in 1899 to house 168 homeless men, mainly who came from the notorious lodging houses in Simnel Street and Blue Anchor Lane that were demolished as part of the slum clearance schemes of the 1890s. St. Michael’s was situated on the west side of Bugle Street and north of Blue Anchor Lane, and towered above the town walls on Western Esplanade. It was demolished in the 1970s. As previously mentioned, records relating to Thomas are confusing, with or without the initial “K’ as a possible middle name. However, there is Merchant Navy Identity Card CR10, and despite the questionable date of birth, appears to relate to Thomas, Fireman. The card shows him serving on ships between November 1918 to September 1921, including RMS Mauretania and Lapland. It is quite ironic that he and Bertram served on Lapland, the ship that brought Titanic survivors back to Plymouth from New York. Thomas does not show up in the 1939 Register, and there is a record of death in 1933 in Southampton, so this is possibly him. When the Southampton Times & Hampshire Express interviewed the mother of the Slade brothers on the 20th of April 1912, she is recorded as saying “What a good job they missed their ship! I have thanked God ever since” “How did they miss the boat?, I can’t tell you exactly, but they left home in good time. My thanks to Dave Marden, author of many books about Southampton Docks and its’ railways, for his authoritative help with information about the dock railway systems and train movements.